In 1954, the late George Grove Sr. started what was later to become George J. Grove & Son Inc. He was one of the counties first installers to offer customers a complete line of home improvement services which was later tailored to a specialization in exterior home improvement. The Manheim Pike business started out in George Sr.’s home with one pick up truck and George Sr. as the sole proprietor and only employee. George J. Grove Jr. entered the business at a very early age, assisting his father and grandfather, Cleon Grove Sr. with installations. The business moved from George Sr.’s home to a shop on Cabbage Hill. In 1973 the business incorporated. In 1978 the business moved to their current location at 1219 Manheim Pike in Lancaster, Pennsylvania. In keeping with the family tradition, George Grove III, Justin Grove and Lindsay Grove also entered the business at a very early age bringing with them the same passion and attitude their grandfather had when he started. They have built their business on a firm belief in a quality product and installation to a completely satisfied customer. They are family owned, and operated. They have built their business on the belief that personalized service, a quality product, and professional installations are the key to satisfied customers. They insist that customers get the best products on the market for their money. The Groves employ a full team headed by George J. Grove Jr., who is dedicated to providing exceptional customer service. The company strives to establish lasting relationships with their customers by exceeding their expectations and gaining their trust through fair prices and exceptional service. They have been loyal members of the community for over fifty years. George J. Grove & Son, Inc. is a member of the Better Business Bureau, the Building Industry Association, the National Association of Home Builders, National Association of Small Business, National Safety Council and the Lancaster Chamber of Commerce. They received the President award from the Great Lakes Window Company for commitment to Sales Integrity, Quality Installations, and dedication to Customer Service and Installation. George J. Grove & Son, Inc. does all types of home improvements. Their product lines include replacement windows and doors, roofing, premium vinyl and fiber cement siding, stone veneer, spouting and gutter protection systems, and patio enclosures. 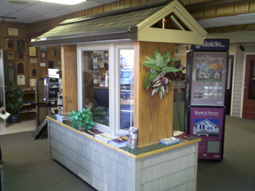 They also carry skylights, railings, decks, retractable fabric and metal awnings, and shutters. All of the products that they carry come with an extended manufacturers warranty and are installed by their quality trained professionals. Customers are welcome to visit our showroom at 1219 Manheim Pike, Lancaster (Get Directions ») to see the many selections of our product lines. To inquire about a free in-home estimate from one of George J. Grove & Sons company professionals call 717-393-0859 or 1-800-498-0859. We are honored by the fact that we are consistently recognized by our customers in the Lancaster community as one of the leading exterior home remodeling contractors. In 2017 we were named the Best of Lancaster County by Lancaster County Magazine, 1st place in the Roofing category and tied for 1st place in the Specialty Contractors category. And as part of the 2017 Reader’s Choice Awards by LNP, we were listed under the Awnings, Doors, Exterior Remodeler, Roofing, Siding, Spouting, and Window Dealers/Installers with five #1 rankings. Thank you to our customers and suppliers for making us one of the most trusted contractors in southcentral Pennsylvania.